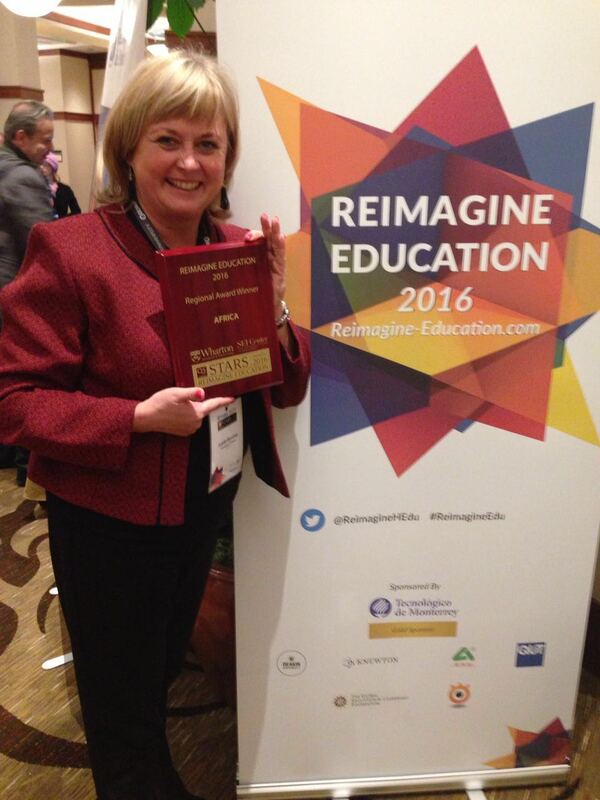 The Centre for AAC won the Regional Gold Award for Africa at the Reimagine Education Conference & Awards 2016 in Philadelphia, USA on the 5th December 2016. Reimagine Education is a leading global education competition and it awards the most innovative Higher Education & EdTech projects. The Centre for AAC was shortlisted for the Hybrid Learning category which focused on the best project that unified web-based learning delivery and traditional learning practices. They additionally looked at how the team improves learning outcomes in a way that foregrounds the learning team (educator and present students), while also leveraging web-based internet resources. This award ceremony is the global awards for innovative education pedagogies enhancing learning and employability. This year‘s Reimagine Education was the most competitive to-date, with over 500 applications received for the 14 award categories. The panel of judges had repeatedly remarked on the high quality of applications for 2016, with hours of conversation and reflection necessary to determine – with difficulty – on each of the 14 shortlists for this year‘s competition. Prof. Bornman and the Centre for AAC would like to send our heartfelt thanks to the Dean of Humanities, Prof Reddy and the Faculty of Humanities at the University of Pretoria for providing funding to Prof. Bornman so she could attend the award ceremony in Philadelphia. We here at the Centre for AAC are passionate about providing an innovative blended pedagogy to our students resulting in enhanced student learning outcome and the acquirement of knowledge and unique skill sets that will impact the lives of people with communication disabilities. That is why we are so incredibly proud of this Award! At a gala event held at the Indaba Hotel on Friday 8 November, the Centre for Augmentative and Alternative Communication was proud to be honoured as one of the 2013 recipients of the Hamlet Foundation awards. For the past 19 years, the Hamlet Foundation, in association with the Clinix Health Group, has bestowed this national award (the only one of its kind in South Africa) on individuals and organisations who have made an outstanding contribution to the upliftment and quality of life of people with intellectual disability. On the 3rd of October 2006 The Centre for Augmentative and Alternative Communication (CAAC) received an Education Innovation Laureate Award from the University of Pretoria, for the Fofa Project. On the 31 August 2004, the Centre for Augmentative and Alternative Communication (CAAC) received an award for: Excellence in Innovation and Sustainability: Social at the 2004 Innovation Award Ceremony incorporating the T-systems: Age of Innovation and sustainability awards (AIS) and the Standard Bank CPSI Public Sector Innovation Awards. We are most grateful for this recognition and express the hope that this award will encourage many more potential users of augmentative and alternative communication and their families to come forward and assist the CAAC and Interface, South Africa in working towards “communication for all” in our country. The Centre for Augmentative and Alternative Communication (CAAC) received the award for the best corporate over the past ten years at an award function of the National Science and Technology Forum (NSTF). To those who continue to support us in our work: THANK YOU!!! As the only training facility of its kind in Africa, the CAAC provides support to individuals who cannot talk and their families, teachers and therapists. The focus is on the use of Augmentative and Alternative Communication (AAC) strategies to supplement the existing communication efforts of these individuals to enable them to participate more independently in society. This award is most significant – not only for those associated with the CAAC and its unique training and research focus that specializes in dealing with severe disabilities, but for the broader disability community in Africa. Prof Erna Alant received a vocational service recognition award from the Rotary Club of Pretoria (Hatfield branch) for exemplifying Rotary standards in the workplace with reference to employing people with disabilities. Shirley McNaughton Award for Exemplary Communication throughout the AAC community and beyond. During the ISAAC conference in Denmark the Centre for AAC was awarded the prestigious Shirley McNaughton Award. The CAAC also received an award for Education Innovation (Laureates) from the Department of Telematics and Innovation, University of Pretoria. The CAAC received an award for Innovative Teaching from the University of Pretoria for breaking new ground in distance education. The CAAC won a Rolex Award for Enterprise for the project "Communication for Life" which aimed at training teachers and children in rural areas to facilitate communication in children with complex communication needs. It is awarded by the Rolex watch company of Geneva, Switzerland which provides financial assistance to men and women seeking to break new ground in areas that advance human knowledge and well being. The Rolex awards recognise pioneering concepts and innovative ideas by giving individuals the means to achieve important objectives. The CAAC was awarded the "Education Africa Presidential Award for special needs" for their contribution to training parents and teachers in the use of AAC strategies in South Africa.